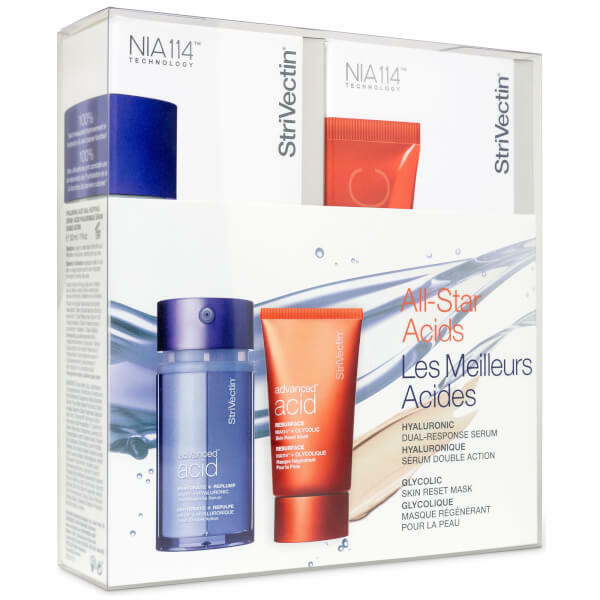 Refresh and revitalise your complexion with the StriVectin Advanced Acid Bundle, a pair of products that utilise active ingredients to sweep away dead cells, smooth out wrinkles and replenish hydration for youthful and radiant skin. Transform the texture of your skin with a resurfacing face mask formulated with a patented NIA-114 complex. Comfortable on skin and effortless to apply, the wash-off mask uses key ingredient Glycolic Acid as an exfoliator, gently lifting away dead cells and toxins to leave behind a refreshed, renewed complexion. Helping to smooth the appearance of fine lines and wrinkles, restore radiance and soothe irritation, the mask aids in creating a brighter, softer skin surface. Replenish skin with intense hydration with a two-part formula ideal for dull and dry skin. Infused with a patented NIA-114 complex, the serum is split into two parts which fuse upon application. The first chamber contains six unique forms of Hyaluronic Acid, an ingredient which can hold 1,000 times its weight in water and which immediately alleviates dryness and discomfort. The second chamber contains a group of potent ceramides to lock in hydration and prevent moisture loss. Melting effortlessly into skin to help smooth the appearance of fine lines and wrinkles and protect against free radical damage, the formula offers both instant and long-term results to create a bright, soothed and youthful complexion. Mask: Apply to clean face AM and PM before moisturiser, avoiding the eye area. Serum: Apply a generous layer over clean, dry skin, avoiding the eye area. Leave on for 5 minutes and rinse with water. For best results use 1 to 2 times per week. Mask: Aqua (Water, Eau), Kaolin,CI 77891 (Titanium Dioxide), Stearic Acid, Jojoba Esters, Butylene Glycol, Lactic Acid, Glycerin, Myristyl Nicotinate, Pentaerythrityl Tetraethylhexanoate, Cetyl Alcohol, Glyceryl Stearate SE, Glycolic Acid, Cyclodextrin, Arginine, Oenothera Biennis (Evening Primrose) Oil, Fragrance (Parfum), Sorbitan Stearate, PEG-100 Stearate, Salicylic Acid, Magnesium Aluminum Silicate, Oleth-3 Phosphate, Hydrogenated Lecithin, Prunus Cerasus Flower Extract, Sodium Hyaluronate, Solum Diatomeae (Diatomaceous Earth) (Terre de diatomées), Soy Amino Acids, Tocopherol, Ethylhexylglycerin, Faex (Yeast Extract) (Extrait de levure), Gallic Acid, Caffeine, Betaine, Sodium Polyacrylate, Mica, CI 19140 (Yellow 5), CI 14700 (Red 4), Xanthan Gum, BHT, Potassium Sorbate, Disodium EDTA, Caprylyl Glycol, Phenoxyethanol, Citric Acid, Sodium Benzoate, Sodium Hydroxide, Benzyl Benzoate, Limonene . Serum: Aqua (Water, Eau), Isododecane, Cyclopentasiloxane, Dimethicone, Dimethicone/Vinyl Dimethicone Crosspolymer, Myristyl Nicotinate, Glycerin, Pyrus Malus (Apple) Fruit Extract, Sodium Acrylates Copolymer, Sodium Hyaluronate, Diglucosyl Gallic Acid, Ceramide NP, Hydrolyzed Sodium Hyaluronate, Acetyl Hexapeptide-37, Ceramide AP, Sodium Hyaluronate Crosspolymer, Ceramide EOP, Phytosphingosine, Lecithin, Butylene Glycol, Propylene Glycol, Dipotassium Glycyrrhizate, Sucrose Palmitate, Trehalose, Urea, Glyceryl Linoleate, Tocopherol Acetate, Sodium Lauroyl Lactylate, Ethylhexylglycerin, Methyl Diisopropyl Propionamide, Pentylene Glycol, Hydroxypropylcellulose, Carbomer, Disodium Phosphate, Ethyl Menthane Carboxamide, Fragrance (Parfum), Menthyl Lactate, Serine, Algin, Isopropyl Palmitate, Citric Acid, Glyceryl Polyacrylate, Xanthan Gum, Phenoxyethanol, Caprylyl Glycol, Potassium Sorbate, Pullulan, Cholesterol, Potassium Phosphate, Benzyl Benzoate, Limonene.